408 pages, hardcover, 10-1/2 x 12-1/2"
Detail of the face of Juno from a fresco in the House of the Tragic Poet. Pompeii is one of the most important archeological sites in the world. Destroyed by an eruption of Mt. Vesuvius that began on the morning of August 24, 79 A.D., the buried city has preserved for all time a unique record of the life of its inhabitants. Unlike other ancient cities such as Rome that have a continuous history and layer upon layer of subsequent development, Pompeii has revealed itself to its excavators exactly as it was on that fateful day. Scorching clouds of fine ash suffocated every living creature, making it impossible for them to flee. Roofs collapsed and buildings were buried under the weight of the stone fragments hurled by the volcano. The massive destruction deprived the city and its people of a future, but also recorded their mute testimony for later generations. 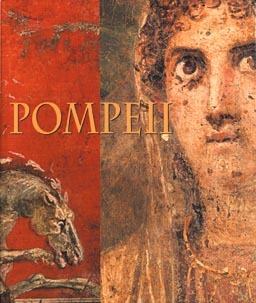 This is the most complete, informative, and beautiful book on Pompeii ever published. 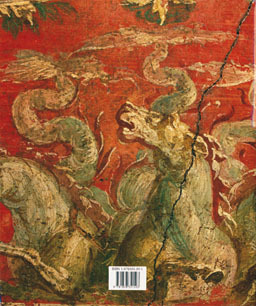 Written by scholars who have been active participants in the excavation and study of Pompeii, it offers the latest research yet is addressed to a general audience. More than 500 color photographs convey the incredible richness of the city, the unsurpassed elegance of its interiors, and the great beauty of its art, including sculpture, frescoes, and mosaics. There is fabulous jewelry, including rings, necklaces, and bracelets. Fifteen individual houses receive detailed attention, along with the famous suburban villas, the Villa of the Mysteries and the Villa of Poppea at Oplontis. The urban development of the city, including the construction of its walls and the function of its government buildings, is explained. A separate section describes the major temples and religious practices. The interesting and varied economic activities in Pompeii are explored through descriptions of the meat and fish market, the office of weights and measures, the taverns and cafes, and the workshops that cleaned and processed cloth. Bread is given its due, with the description of a bakery. And there is a rustic villa, the Villa della Pisanella at Boscoreale, with its machinery for producing oil and wine, its apartments for the owners, and dormitory for the slaves. The fascinating social life of Pompeii is seen in descriptions of the gladiator games, athletic competitions, the theaters, and the public baths. There is a section on the famous Lupanare, or brothel, and a concluding chapter on funeral practices and the many tombs that line the streets outside the city walls. This book will appeal to travellers, to students of Rome and the ancient world, to artists, designers, architects, urban planners, historians, and anyone else who might wish to understand and appreciate the beauty and achievements of Pompeii. Filippo Coarelli (Rome, 1936) is Professor of Greek and Roman Antiquities at the University of Perugia. He is one of the foremost experts on Roman antiquities, a connoisseur of the history of early Rome, and a leading expert on Roman topography. Emidio de Albentiis (Milan, 1958) received his degree with a thesis devoted to one of the insulae in Pompeii, and has written many studies of Roman houses and of the artistic culture of the Republican and Imperial eras. He presently teaches art history at the Academy of Fine Arts of Perugia. Maria Paola Guidobaldi (Colonella, 1961) received her doctorate from the University for Studies in Perugia. Besides works on history, topography and Roman antiquities meant for a popular audience, she is the author of scholarly papers on various aspects of the Romanization of ancient Italy. On the staff of the Archeological Superintendence of Pompeii, she is currently director of the excavations at Herculaneum. Fabrizio Pesando (Ivrea, 1958) is Associate Professor of Classical Archeology at the University of Naples and teaches Archeology of Magna Graecia and Antiquities of Pompeii and Herculaneum. He has specialized in the history of the private house in Greece and Rome, the archeology of the Vesuvian cities and the historical topography of Greece and ancient Italy. He is in charge of excavations at Pompeii and Herculaneum for the Istituto Universitario Orientale. Antonio Varone (Angri, 1952) is the Coordinating Archeological Director for the Ministry of Cultural Assets and Activities and since 1984 has been in charge of the scientific-cultural service of the Archeological Superintendence of Pompeii. His many publications include one on the excavation of the Insula of the Chaste Lovers that began in 1987, and a study of inscriptions on walls in the area surrounding Vesuvius for a new supplement to volume IV of the Corpus Iscriptionum Latinorum.